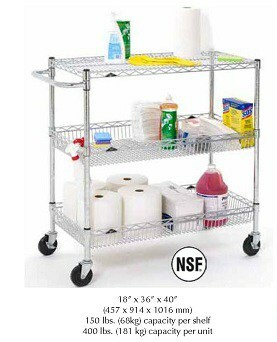 Metro Basket Utility Cart includes 1 Flat Super Erecta Shelf and 2 Super Erecta Basket Shelves. Each basket shelf has a 3 1/2″ high ledge. Comes with 4″ casters and a handle for easy maneuvering. Metro Basket Shelf Carts provide a secure way to transport your sensitive products. Because they have sides on the basket shelves, they prevent product from falling off. Furthermore, basket shelves can be configured into a mobile cart. Each basket shelf is 3 1/2″ deep, to keep items secure during transfer. • Metro Basket Utility Carts are ideal for compartmentalizing bulk, odd-shaped supplies. • Baskets have a semi open front for easy access. Metro Basket Utility Cart includes 1 Flat Super Erecta Shelf and 2 Super Erecta Basket Shelves. Each basket shelf has a 3 1/2" high ledge. Comes with 4" casters and a handle for easy maneuvering. Metro Basket Shelf Carts provide a secure way to transport your sensitive products. Because they have sides on the basket shelves, they prevent product from falling off. Furthermore, basket shelves can be configured into a mobile cart. Each basket shelf is 3 1/2" deep, to keep items secure during transfer.